Friday was hands down the best day we have experienced all year up here in the North Pole! Sunny, sunny, sunny and it reached SEVENTY! Glorious! I wore....wait for it.....wait for it....FLIP FLOPS! And in the afternoon I ran several errands and got my first pedicure of the season. At a new place. Just your normal nail salon in a strip mall (next to...cough...Walmart...cough) but it's new. I like new. So I gave it a go. I LOVE the massage pedicure chairs. Best. Chairs. Ever. However the salon has been open for three weeks and they still have the plastic bubble wrap on the controls. I'm sure this was done because they are expensive chairs and the owners are proud of their investment. But it means I had to ask my nail lady to turn it on because it is impossible to read anything when covered in ratty bubble wrap. I just thought it was funny. So the pedicure was excellent and the leg massage was A-MAZ-ING! I walked out of there a new woman! With pretty pink toes. Before my pedi, I popped into my favorite dirty shoe secret store. Payless. I've said it here many times before, I love that store. Similar to Old Navy, it's very hit or miss. And OK, so the quality is not that of anything sold in fancy pants stores (of which we possess none up here in Unpreppyville). But the prices are bargain-tastic! Who cares if they fall apart after one season when you only paid $12. Though I have to tell you, I have Payless shoes that are at least five years old and still look great and garner lots of compliments. I always laugh and quickly confess that they are in fact oldie but goodies from the big orange P! So looky look at what I found. They were having a buy one, get one half off sale. 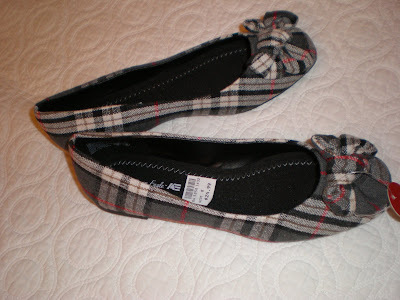 So the plaid shoes (that will get put away until fall) were on sale for $9, but only cost me a whopping $4.50. 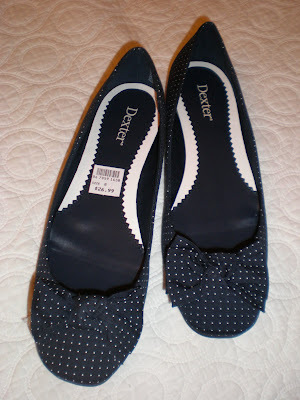 My total bill was less than $25 for the two pairs of cutie ballet flats. Polka dots and bows, oh my! Oh how I love a good shoe bargain! Saturday was cold and drippy and Sunday was cold but the sun was out, so it made it all better. I had a luncheon at my sorority and guess who wore here first Lilly shift AND pair of new Bonnonos of the year? Me, me, me!! As usual, I looked a damn fool in my preppy get-up, living in Unpreppyville, North Pole, USA. But whatev, that's never stopped me before. I was thrilled to bits to finally see a day warm enough to warrant a Lilly shift! And to spite me, Old Man Weather has decided to literally rain (cold cold rain) on my sunshine parade. Rudeness. At least I have my trip to Fort Lauderdale next month to look forward to! Ooh I love your new shoes! Too cute - BOGO is awesome! And I know what you mean about feeling like a new woman after a pedicure - I love that feeling! Those are adorable! Don't you love finding cute things in unexpected places? Oh, we love the footwear Miss PPC! Those shoes are so darn cute. And we say to heck with UnpreppyVille, because we know you look just darling. Congratulations on your first pedicure of the season! I got one when I was in Houston in March but it was wasted when I got back to the land of cold weather. There's nothing quite like freshly painted toesies to make you happy. Those shoes are adorable! I'm going to have to find a Payless around me. Cute shoes. I never would have even thought to look in Payless.